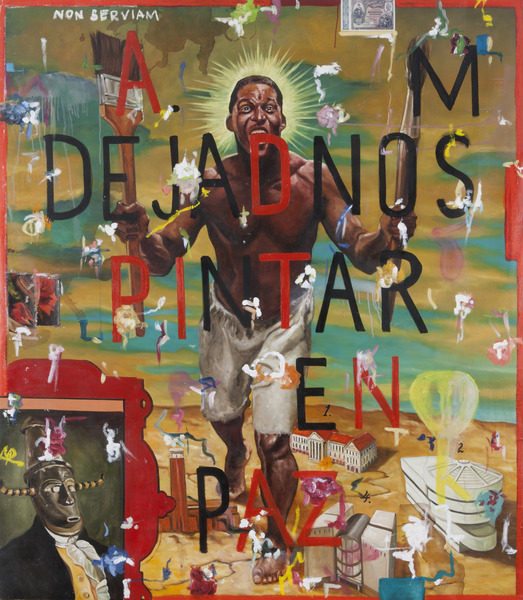 Armando Mariño graduated from the Provincial School of Arts in Santiago de Cuba (1987) and the School of Artistic Education at the “Enrique José Varona” Superior Pedagogic Institute in Havana (1992). Mariño received the Second Prize at the 1st Salon of Cuban Contemporary Art (National Museum of Fine Arts, Havana, Cuba, 1995) and the Honorary Mention at the 30th Festival International de la Pinture (Château-Musée Grimaldi, Cagnes sur Mer, France, 1998). He has been artist in residence at institutions like the Bronx Museum of the Arts, the Chashama Studios in Brooklyn, the Pollock–Krasner Foundation, the Christopher Reynolds Foundation, and the ART/OMI Residency, all of them in New York; the Mattress Factory in Pittsburgh, Pennsylvania; the Rijksakademie van Beeldende Kunsten in Amsterdam, Netherlands; and the Botín Foundation in Santander, Spain, among others. 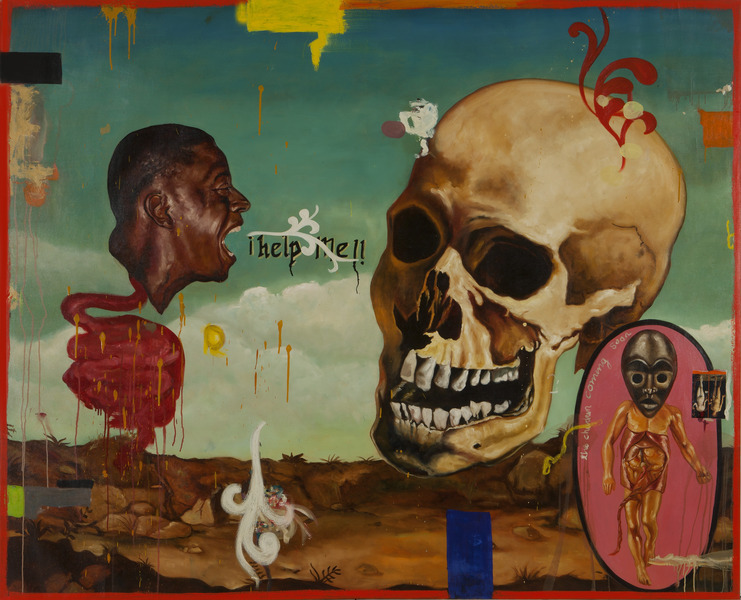 His works are part of the collections of the National Museum of Fine Arts and the Wifredo Lam Center of Contemporary Art, both in Havana, Cuba; the Deutsche Bank Collection in the United States; the 21c Museum in Louisville, Kentucky; the Arizona State University Art Museum in Tempe, Arizona; the Berardo Collection at the Museum of Modern Art in Sintra, Portugal; the National Museum of Valjevo in Serbia; the Gallegan Center of Contemporary Art in Galicia, Spain; the University of Virginia Art Museum in Charlottesville, Virginia, among others. 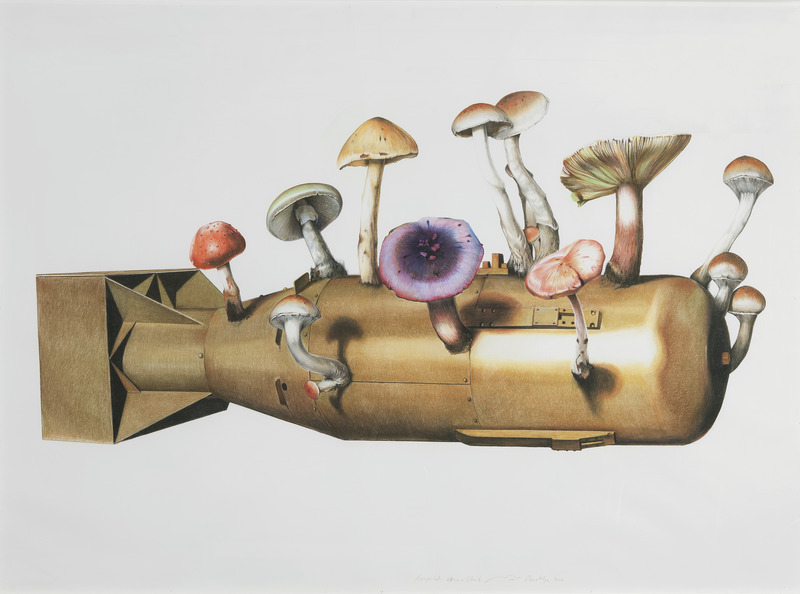 Recycled Atomic Bomb, 2010. Charcoal and pastel on paper, 58 1/2 x 81 in. Inferno, 2012. Oil on canvas, two panels of 80 x 72 in. each. Dejadnos pintar en paz (Let Us Paint in Peace), 2001. Oil on canvas, 77 1/4 x 67 x 1 in. House, 2007. Oil on linen, 78 1/2 x 78 1/2 in. Happy Protester, 2012. Oil on paper, 30 x 44 in. 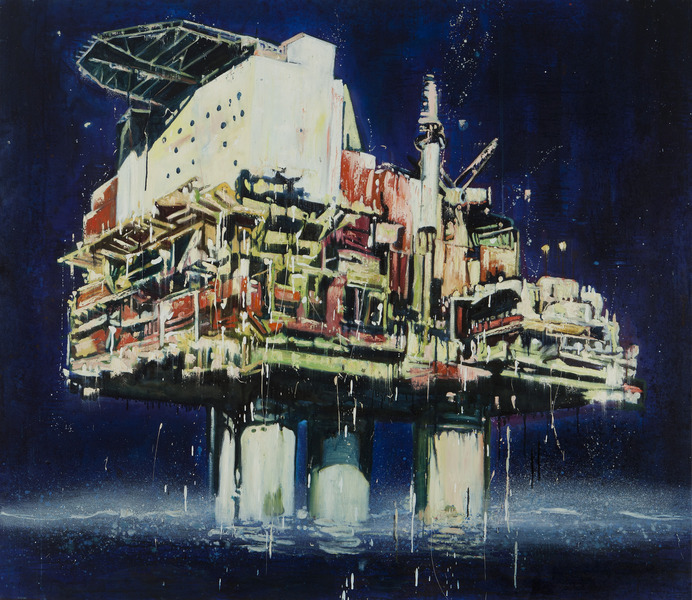 Plataforma II (Platform II), 2009. Oil on canvas, 57 x 66 in. 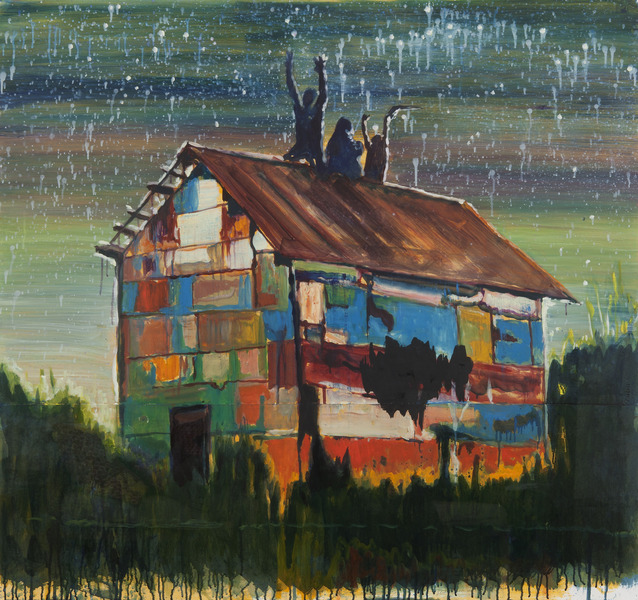 Revolution in the House of Colors, 2011. Oil on paper, 38 1/2 x 40 1/4 in. Chaise lounge black leather, de la serie Herencia colonial (Chaise Lounge Black Leather, from the series Colonial Heritage), 2001. Watercolor on paper. 55 x 75 in. Waiting for God, 2013. Oil on canvas, 60 x 40 in. Sangre y honor (Blood and Honor), 2002. Oil on linen, 71 x 87 in. Prayer, 2007. Oil and mixed media on canvas, 19 1/4 x 29 in. 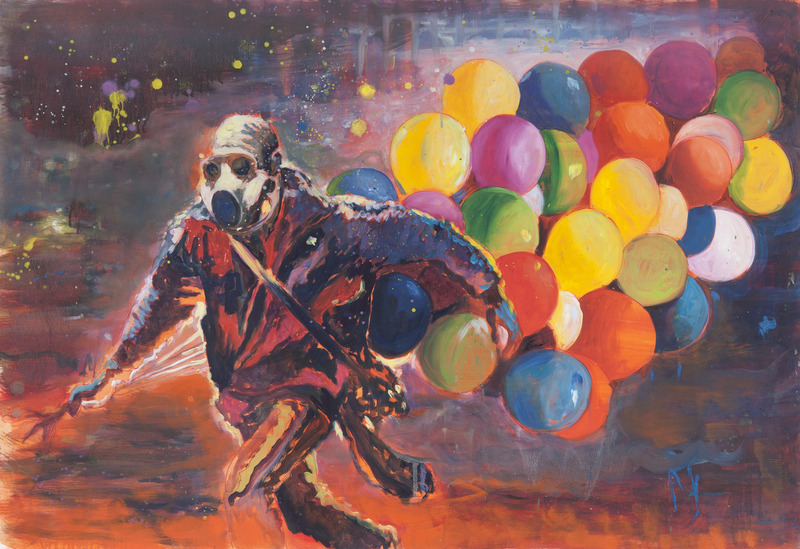 What About the Future, 2012. Oil on paper, 22 x 30 1/4 in. Two Monks, 2013. Oil on canvas, 27 1/4 x 35 1/4 in. Shaman 2, 2011. Oil on canvas, 72 x 48 in. Crazy Horse at Disco, 2011. Oil on paper, 23 x 30 in. Riders, 2012. 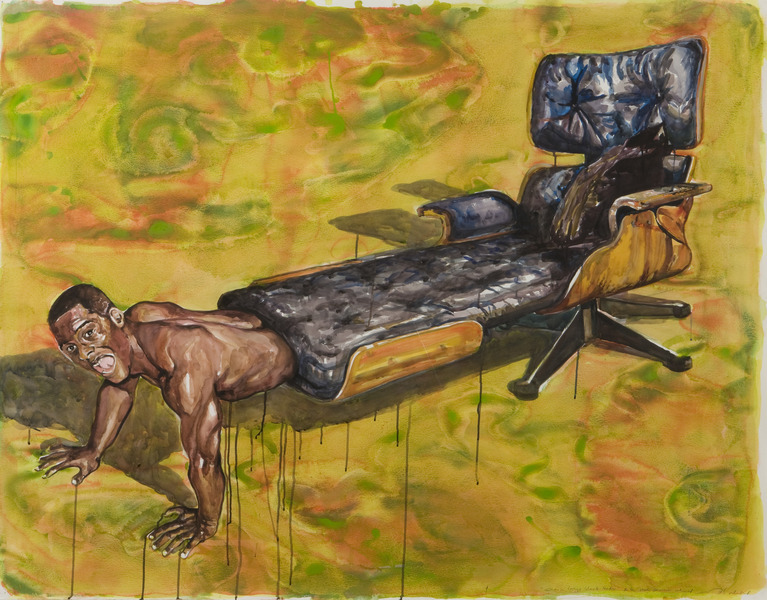 Oil on paper, 20 1/2 x 44 in. Tree House, 2012. Oil on paper, 30 x 44 in. Red Boy, 2012. Oil on canvas, 47 3/4 x 36 in. 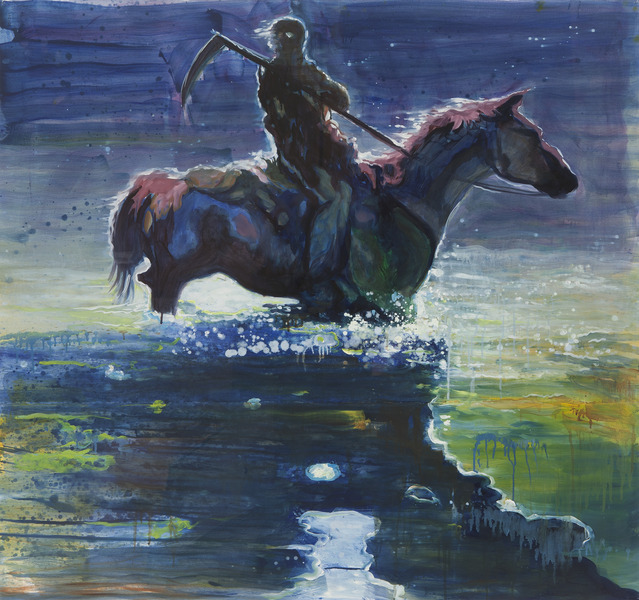 The Lost Rider!, 2011. Oil on paper, 38 x 40 1/2 in. Shaman, 2011. Oil on paper, 28 x 19 3/4 in. The Flower Man, 2012. Oil on paper, 30 1/4 x 22 in. 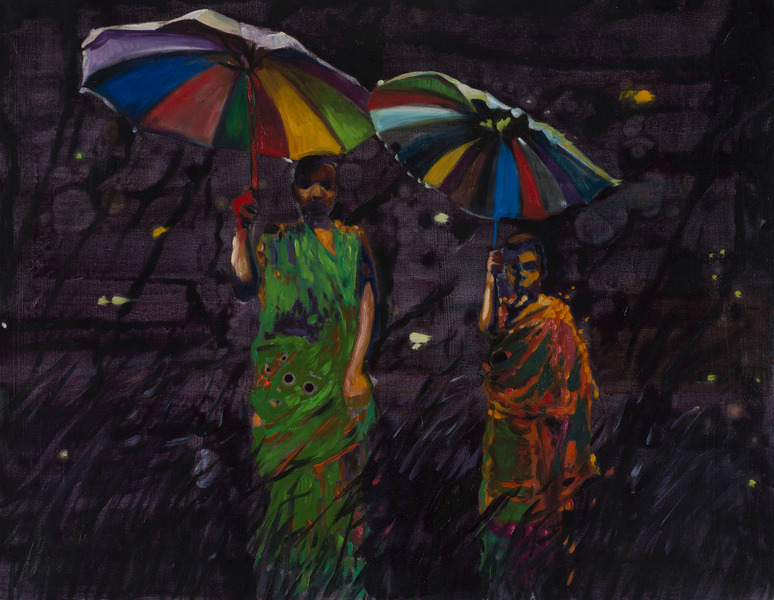 Girl Over Trouble Waters, 2013. Oil on canvas, 92 1/2 x 71 1/2 in. Holy Man, 2012. Oil on canvas, 39 x 31 in. Belfast, 2013. Oil on canvas, 92 x 80 in.